Nearly everything that Pixar touches turns to gold. When Cars Land opened in Disneyland’s California Adventure, the atmosphere matched the original films’ vibe so closely that as you strolled to each attraction in Radiator Springs, you couldn’t help but feel like you were sightseeing in another world – a community of sassy vehicles cruising somewhere along Route 66. I always get a little sedimental around the Holidays. The most impressive feature may be Monument Valley: a massive sprawling rock formation that houses the “Radiator Springs Racers” track. It’s so detailed that you’re almost fooled into thinking that the towering behemoth occurred naturally. 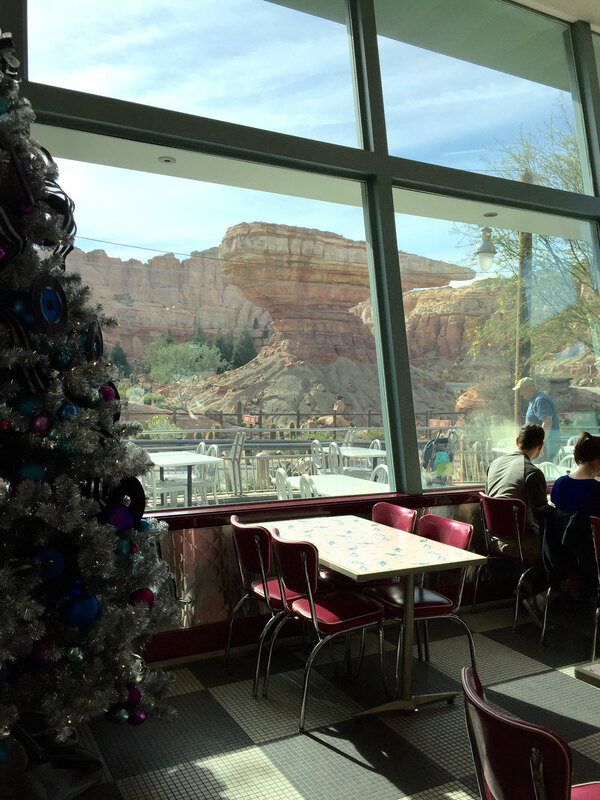 The lone restaurant in Radiator Springs, Flo’s V-8 Cafe, is right across the “street” from Monument Valley. 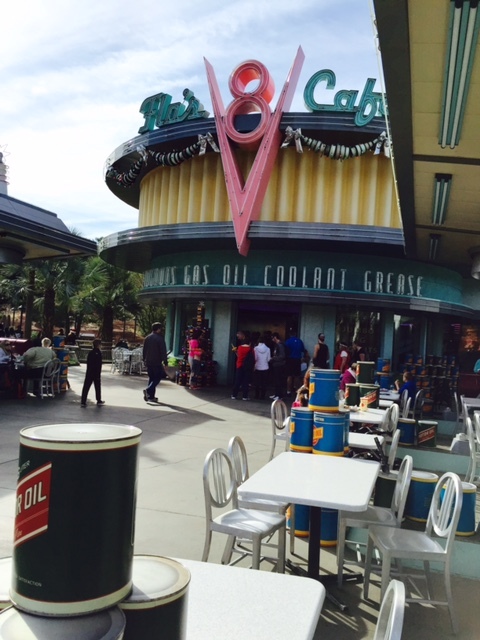 You can enjoy your grub as you watch racers lose their hats as they speed around the curves. With the jukebox blasting oldies-but-goodies and car-themed tunes, the experience is quite trippy, to say the least. This is a quick service diner that begs for you to stay a while. Even the jukebox has chrome bumpers. It’s so shiny, you could primp your beehive while you wait. 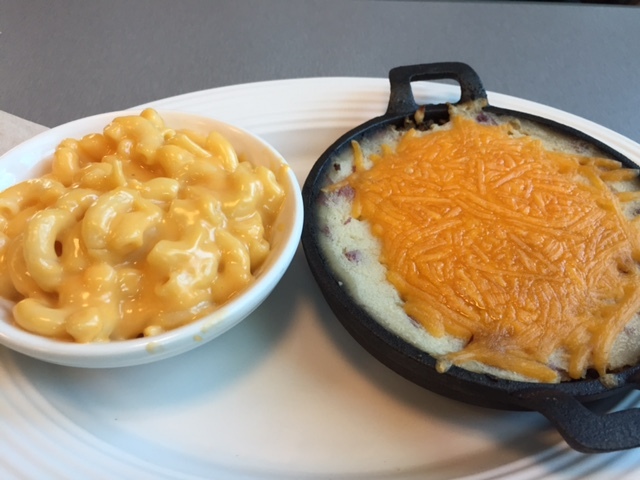 Flo recently updated her menu, adding a turkey dip and a roast beef & cheddar sandwich with horseradish aioli to the basic (and consistently delicious) meat-and-potatoes-and-cole-slaw dishes. They also kept their fabulous Veggie Tater Bake, which happens to be the best vegetarian option this side of Disneyland (on the other side of the park, the Hungry Bear has a fantastic cornmeal-crusted fried green tomato sandwich). There’s also breakfast at Flo’s for you early birds, but I’m always too late to try the brioche french toast with bananas and caramel. 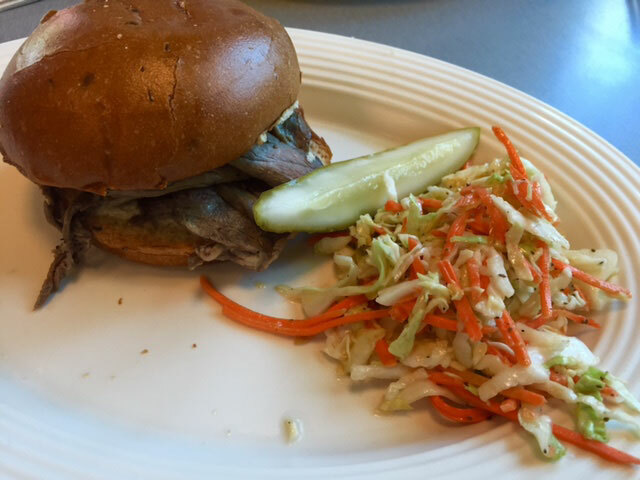 Roast Beef & Cheddar with cole slaw and a pickle. For the most part, the Flo’s experience is wonderful and the food is satisfying. You can’t beat the speedy service and the location is prime for those pit stops between rides. Plus, you are served on real plates with ACTUAL silverware – a small touch that really classes up the joint. Unfortunately, the new sandwiches aren’t so successful. Much like the signature Pixar sense of humor, the roast beef & cheddar is a little dry. Stick with the pork loin, Coca-Cola ribs, or rotisserie chicken with sides. The turkey dip with au jus sounds appealing, and may be perfectly delicious, but I wouldn’t touch it without a side of sinus-clearing horseradish at the ready. As for the pies: save room for churros on the boardwalk. The Veggie Tater Bake with mac and cheese. Comfort food of the highest order. Personally, Flo’s is a must-stop. 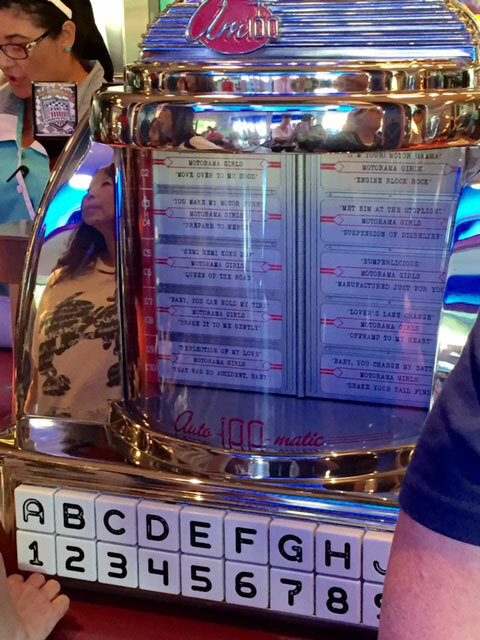 On a couple of recent visits, the jukebox playlist really surprised and delighted me. I devour the music of the 50s and 60s, and Flo’s routinely throws a few rare gems in the mix. Most recently, I chewed to the sound of Debbie Dean’s “Don’t Let Him Shop Around”. Most of your throwback diners will opt for the low-hanging fruit of Smokey Robinson’s original song, but few would dig deeper for the never-in-rotation Motown response record. 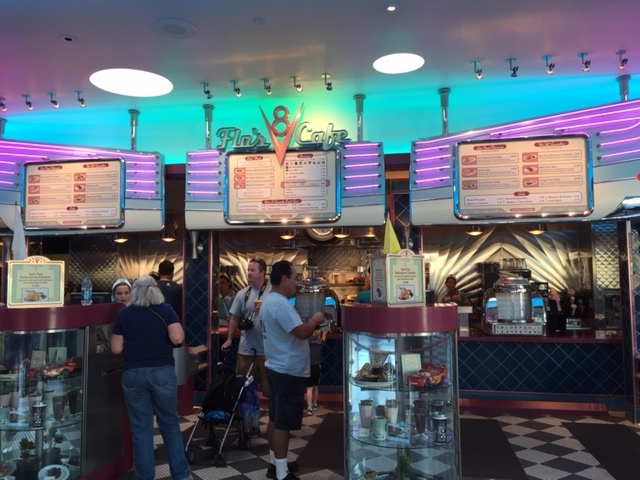 With so many other restaurants in California Adventure, Flo’s just goes the extra mile to keep her customers entertained. Welcome to Flo’s. Regular or unleaded?